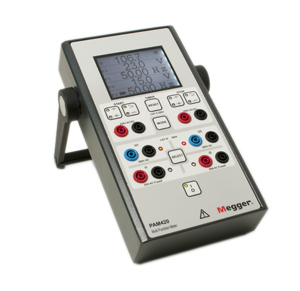 Compact and lightweight as well as fast and easy to use, phase angle meters in the new PAM400 range from Megger offer a convenient and cost-effective solution for a wide range of applications, including checking polyphase metering installations, testing protective relays, making comparative tests in electrical substations, and verifying phase angle deviation on power transformers. The PAM400 range includes two models. The PAM410 provides facilities for accurately and quickly measuring the phase angle between two voltages, two currents or between one current and one voltage. Voltages up to 500 V and currents up to 25 A can be connected directly to the instrument, and the current range can be readily extended by using external current transformers. The instrument displays phase angle directly, with a resolution of 0.1º, – no calculation or interpolation is needed. The second instrument in the range, the PAM420, provides phase angle measuring functionality identical to that of the PAM410, but adds facilities for two-channel voltage, current and frequency measurement. It also has a high-accuracy timing function that can be triggered by voltage signals or volt-free contacts, and can measure times up to 999.999 s with a resolution of 1 ms. The PAM420 has a built-in rechargeable battery, allowing it to be used in almost any location. Supplied complete with a carrying case, test lead set and, in the case of the PAM420, a mains-operated battery charger, Megger’s new compact phase angle meters feature robust construction to ensure long life even in tough operating conditions. They have a CAT III 500 V/CAT IV 300 V safety rating, except for the timer inputs on the PAM420, which are rated CAT II 250 V. Both models can be calibrated locally – full instructions are given in the user manual – which eliminates the inconvenience and cost of having to send them to a specialist calibration facility.